Editor-in-Chief Dr. David Grau, Arizona State University, USA. 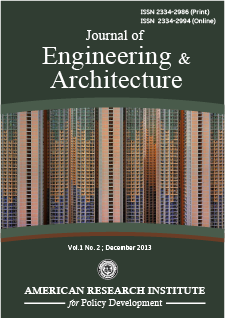 Journal of Engineering and Architecture is an international peer-reviewed journal published by American Research Institute for Policy Development. The journal is not limited to a specific aspect of engineering and architecture but is instead devoted to a wide range of subfields in the engineering sciences and architecture. Articles of interdisciplinary nature are particularly welcome. The journal strives to maintain high quality of publications. There will be a commitment to expediting the time taken for the publication of the papers. The editorial board reserves the right to reject papers without sending them out for review. The journal also publishes innovative contributions on every aspect of architectural endeavor. Each paper published in Journal of Engineering and Architecture is assigned a DOI®number, which appears beneath the author's affiliation in the published paper. Click HERE to know what is DOI (Digital Object Identifier)? Click HERE to retrieve Digital Object Identifiers (DOIs) for journal articles, books, and chapters. Dr. David Grau, Arizona State University, USA. Dr Apostolos Pesiridis, Dept. of Mechanical Engineering, Brunel University London, UK. Dr. Donaldas Zanevičius, President of Lithuanian Engineers Association (LEA), Lithuania. Prof. CHARKAOUI Abdelkabir, Private University of Marrakech, Morocco. Dr.. Niara Clara Palma, Dept. of Urban and Regional Development, Universityof Santa Cruz do Sul, Brazil. Dr. Yashin Sergey Nikolaevich, Department of Innovation Management, Nizhny Novgorod State Technical University, Russia. Dr. C. Srinivas, Dept. of Mechanical Engineering, R.V.R&Jc. College of Engineering, India. Ing. JánTvarožek PhD., Faculty of Special Technology, Alexander Dubcek University of Trencin, Slovakia. Dr. Ali Sadiq Yasir, Department of Mechanical Engineering, University of Kufa, Iraq. Bc.Ing.Linda Makovicka Osvaldova, PhD., Dept. of Fire Engineering, University of Zilina, Slovakia. Dr. Manal Abdel Rahman Sorour, Dept. of Food Engineering and Packaging, Food Technology Research institute, Egypt. Prof. Mohsen Shafiei Nikabadi, Dept. of Industrial Management, Semnan University, Iran. Prof. Dr. Attaullah Shah, Dept. of Civil Engineering, University of Engineering and Tech Taxila-Pakistan. Professor Ikemefuna MBAMALI, Dept. of Building (Environmental Design), Ahmadu Bello University, Nigeria.